I post a lot of book reviews on Goodreads, but I've never posted a full book review on this blog. I thought I'd remedy that today. This book review post is going to be for a book I first read a while ago -- Hunt for the Horseman by Gita V. Reddy. It has recently been re-released with some better copyediting and a new cover, so I feel like that deserves some celebration. I've waxed lyrical about the book in this post, but I didn't go into very much detail. That's about to change. 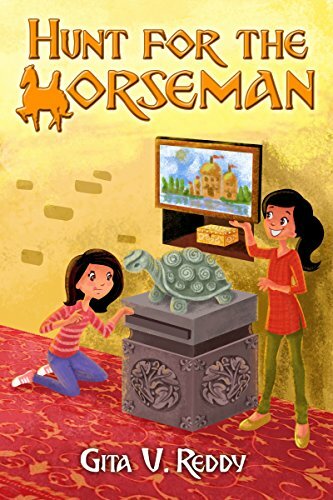 Hunt for the Horseman is about twelve-year-old Sandy and her visit to her family's palace, Amrita Mahal, for what could be her family's last reunion. Why might it be their last? Because the notorious "land mafia" is trying to get their hands on the palace, and an important document, which would prove the family's ownership beyond a doubt, has gone missing. Since this is their last family reunion, the children of the family decide to try and do what nobody has managed to do before: find a toy horseman which one of their ancestors hid a hundred and twenty-five years ago! I was caught up in the magical description of the palace and its grounds. Amrita Mahal is a place of mystery, full of hidden compartments and secret tunnels. I also loved all the characters, from tech whiz Gaurav to food junkie Avinash to the resourceful Megha. And I loved the story itself, and how it kept me turning the pages right up until the end. Plus, it's one of the few books which has literally made me laugh out loud.